The Rookie Scouting Portfolio Football Writers Project is an all-star cast of football writers, former scouts, and draft analysts on the Internet. Their mission is to take a month to build a 53-man roster with a $160 million salary cap and present the team here. You can use the same information to build your own team (see the bottom of this post). Last night, I unveiled the skill positions of a first-draft team. Today, I’m unveiling my offensive line. Remember, this is an initial draft and I will probably take a month to truly build my squad. However, I think it is valuable and entertaining to display a thought process behind building a team. Readers will hopefully gain this insight when I display other writer’s teams, but they won’t get the same process as I can offer leading to the final product. I am already working on a second draft of the team I’m unveiling this week and there will be some major changes. However, I still think it is fun to show my initial version because it reveals a lot about building NFL teams. Why certain ideas are ingrained in the culture of coaches, general managers, scouts, and players. If you didn’t read the skill position unveiling yesterday, the highlight of the post is that I went with virtual unknowns at the running back position, wide receivers with no more than one year of NFL experience, and developing prospects at tight end. The reason is partially due to what I did with the rest of my team, which you’ll see in the coming days. Offensive line is a significant reason why. Participating in this project is initially reinforcing my belief that a strong offensive line can make or break an offense more than the running back or its receivers. I think there’s less drop-off with running back in the league than along the line. Quality offensive lineman also have a longer shelf life than runners. 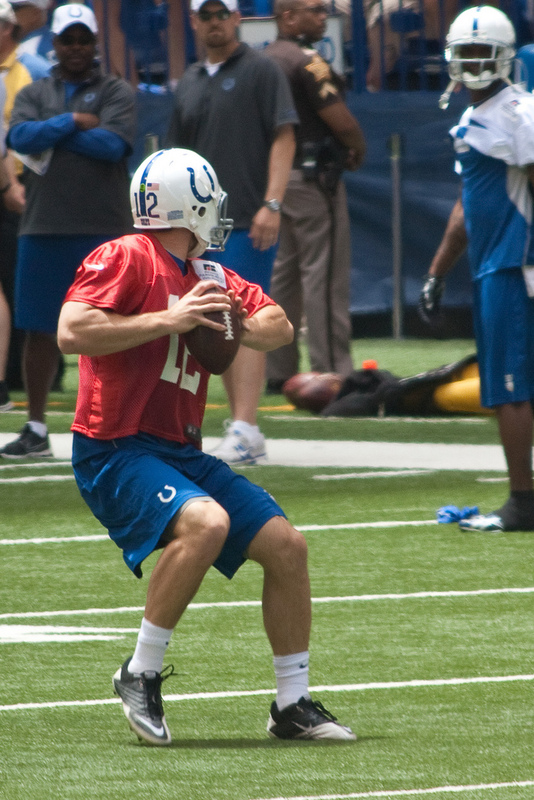 I also want to give my young quarterback Andrew Luck time to develop into the franchise player I believe he’ll become. The fewer hits he takes and the more time he has to make plays as designed, the faster he’ll begin to process the game at an even more advanced level. I believe this offensive line will be one of the best around, and good enough to elevate one of my “unknown” backs to a 1200-yard, 8-touchdown runner. It also needs to be strong at protecting the edge yet, mobile to run screen plays and some angle plays where I need to pull a guard or tackle. I want to consider running the stretch play and that means I need at least one tackle that can get outside and then use play action off it. I believe my backs will function better in primarily a zone blocking scheme, but teams generally have a variety of play types. My lineman will fit the bill here and give my backs every opportunity to exceed popular expectations. Another important facet for this team is that I need a veteran line that executes well and without penalties. Clean, technique-driven play is something that I want my skill players to see in practices and learn that there’s a culture within my organization that does not tolerate sloppy play. This line will give the skill players every chance to have success on first and second down and minimize the emotional roller coaster that can happen with frequently penalized teams. Travis Benjamin has deep skills and he’s a great open field runner. Get him to the edge, and he can be effective. My offensive line offers the versatility to make this an underrate, young team on the rise. I’d like to run the occasional sweep, but with my collection of tight ends that I can use in H-Back packages, I envision using some Jet Sweep/reverse packages from a 20 personnel spread look where I motion Randall Cobb, Travis Benjamin, or Mohammed Sanu to the backfield from the slot and use my two backs from the 20 or 21 personnel sets to lead block the edge and pull one of my guards. This is similar to what Dana Holgersen does at West Virginia with Tavon Austin – and what Gus Malzahn did at Auburn. While I can’t solely rely on my slot receiver to be my outside running game, this is just one nice wrinkle that I think can generate big plays in the offense and I can build play action from the look get my H-Back behind a linebacker or possibly catch a safety biting and throw it behind him. I could also get crazy and try a double reverse pass with this personnel by running this jet sweep to Sanu, have him him toss it to Cobb, and let the former Kentucky version of Hines Ward, throw it down field to the speedy Benjamin or the vertically-gifted Childs. Not a play I’d use every week, but a fun possibility for an aggressive defense to keep opposing coaches up a little longer. While I’m not a fan of the Wildcat, I could use use Sanu, Cobb, and Benjamin in this capacity. Especially Sanu and Cobb, who had success at the college level executing versions of it at Rutgers and Kentucky. Both are physical runners and I might even try throwing a pass or two to Andrew Luck, who I watched make a one-handed grab along the sidelines at Stanford that rivaled any blue chip tight end prospect I’ve ever seen. Gadget plays aside, I want to be able to line up and dare defenses to beat us at the line of scrimmage. I think this line accomplishes this task. This is the hard-nosed front line I want that is going to bring the lunch pail and help my young skill guys look good. Tackles (Michael Roos, Bryan Bulaga, and Cordy Glenn): Roos is the most expensive left tackle of the project, but I think he’s worth it. He’s still young enough to provide another 5-7 years of strong play as Luck’s left-hand man. He has some weaknesses off the edge in terms of facing a power rusher but among the linemen in today’s game he might be the best all-around player on the blindside. Bulaga might be one of the best right tackles in the game and he’s quick enough that he could sub for Roos at left tackle if needed and do a great job. In fact, he could probably stay there and I’d be almost as happy with him. If I want to use the stretch play, Bulaga can get outside. He’s also good at pulling and leading runners. Cordy Glenn is projected by some as a guard, but he rookie from Georgia flashes skill to play tackle. I like the idea of having that versatility not just at tackle, but also guard. I’m essentially three-deep at tackle and four-deep at guard. Levitre will be my left guard. There are better players when it comes to having the agility to pull and move around in open space, but he’s a solid player in the screen game and I think he’ll continue to get better at this aspect of the game. Levitre will do a strong job of doubling the DT or NT or provide backside blocking. What I love is his pass protection and skill at picking up blitzes. This is essential for a quarterback like Luck, who I expect to thrive at line of scrimmage diagnosis of defensive schemes and adjust accordingly. I know that Levitre will handle stunts, blitzes, and he can beat defenders to the corner and keep the pocket clean. The rookie DeCastro is a nasty run blocker with great skill at pulling and driving defenders. He and Bulaga are going to allow me to run plays to the perimeter as moving parts while Roos and Levitre set up shop one-on-one or combo blocking. I have to be honest, adding DeCastro to this line is like insult to injury. He’s going to be an exclamation point to my run blocking that hurts defensive coordinators when they see him punctuate plays with his skills. He and Luck are also thoroughly familiar and this will help build rapport between the rookie quarterback and the line when it comes to adjustments and Luck’s tendencies in the pocket. With Glenn capable of playing guard or tackle, Lilja might be unnecessary and I could save another $1.5 million and upgrade other positions (RB Ronnie Hillman after all?). However, I got Lilja for depth and I like his skill to get to the edge and he plays a penalty-free game. With the surrounding talent on this line, Lilja will be effective on double-teams and some of his weaknesses can be hidden. If I had to use him at guard, it would probably be right guard with Glenn on the left side because I don’t think Lilja is great at blitz pickups. However, Glenn is untested, so I’m just hoping my normally durable line stays that way. John Sullivan is an underrated player. If I want to pull him and DeCastro to run outside, Sullivan can do it. He’s not awesome at it, but passable. If I want him to block the middle and double-team, he’s good enough to do the job and make DeCastro look okay until the rookie gets better at this aspect of the game. Levitre is already good at double teams. He’s a good pass protector and picks up blitzes well. Like most of this line, he’s not penalized much. He was only penalized once last year in nearly 1000 snaps. Pretty awesome. When you have a veteran line that plays well and plays clean, even veteran defenses get sucked into making mistakes due to frustration. Will Montgomery is a good run blocker with strength and a developing pass blocker. He drops his eyes at times and when defenses stunt or twist, he can bite on the movement and get sucked into the vortex. He is good against the power rush or bull rush and strong enough to deliver a strong punch. I think he has room to get better and he’ll probably be a starter on other teams on this project. Another player I probably don’t need as I do revisions, but I’m making the offensive line a huge priority at this stage. You can see that the cost of this offensive line meant I had to go budget level elsewhere. However, I think Luck at $12 will prove to be a fine gem and it makes no sense surrounding him with anything but 18-karat gold. Interesting read so far, Wildman. A little bit surprised you’ve went with as much youth as you have so far, but then maybe I shouldn’t be. 🙂 Looking forward to seeing the D.
I’ve been tinkering with this for over a day now, and I’m getting it ground down to a point(I think) as far as a first draft goes. Feel good about the D, but need to massage the OL given what I’m going after(ZBS with a heavy slant toward strong pass protectors). I’m enjoying this probably far more than is healthy.